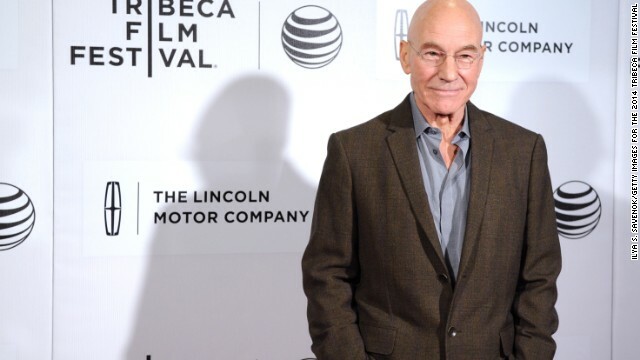 Sir Patrick Stewart attends the 2014 Tribeca Film Festival in April in New York City. The video is titled "Sweet Hat Bro"
(CNN) -- Nope, Patrick Stewart, we don't get it either. The Internet has fallen in love with a video of the 74-year-old actor, posted by his wife, in which he wears a Christmas hat that sings and dances. You read that right. Stewart, best known for his roles in the TV show "Star Trek: The Next Generation" and the "X-Men" film franchise, sits looking somewhat confused as the elf cap dances on his head, lights up and plays a jaunty tune. His wife, Sunny Ozell, can be heard laughing in the background. By the end of the video, which is titled "Sweet Hat Bro," Stewart is also laughing.